Spotify has a business concept that, let’s face it, inherently sounds shady. ‘Get any music for free through the internet!’ Yeah, thanks Napster. Thanks Limewire. Thanks Pirate Bay. So how did Spotify’s video promos distinguish it as a legitimate streaming service and proceed to create revenue in an age where pirating became the norm? Well, it didn’t. To summarise, the video in a nutshell says “With Spotify you can get free music on whatever device. Just search for it, and play it. Great, right?” to a background of exciting jazzy drums designed to get your heart rate up. There’s no explanation of who Spotify are, how they’re different from the competition or why their product is better than ones before. The benefits of the app are left to speak for themselves. Most interestingly, outside of the short phrases that flash on screen the visuals are otherwise meaningless. They’re designed purely as a rhythmic support for the main product: the music. Go check out 32 seconds into the video, where a leopard on a skateboard is propelled past the screen by a jetpack. Not even joking. In every blog about corporate animation one of the case studies you’ll see time and again is Dropbox. I’ve talked about the phenomenal effectiveness of their explainer video multiple times in past articles: after all, going from relatively-unknown-startup to over 100 million users and 30,000 video views per day is nothing to sneeze at. But why exactly did they find so much success with such a simple animated video? 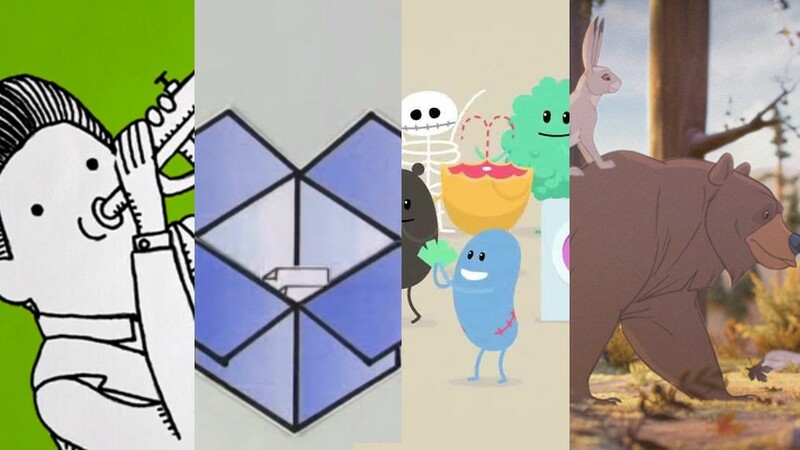 The video itself has many favourable features, including a unique ‘paper cut-out’ animation style, and a succinct explanation of what, at the time, was a strange product concept. But where Dropbox really shined was the context of the video. Visitors who landed on their front page were greeted by nothing other than this short explainer video and a button offering a free download. Watch the video. Now download a free trial. That’s it. This method reflects a very strong conversion funnel. The video gives peace of mind to a consumer who may be hesitant about the new product, then the simple call-to-action (download a free trial) solidifies the consumer’s connection with the brand, making it much easier to convert to being a paying customer down the road. The word ‘sharable’ gets thrown around as virally as the word ‘viral’. It’s every marketer’s dream to develop a campaign that people can’t stop showing their friends. But what truly makes a video sharable? A quick look at one of the most highly watched Australian animated campaigns will teach us a few traits about sharability. If you haven’t seen it previously, ‘Dumb ways to die‘ was a community service video of sorts, commissioned by Melbourne’s Metro Trains in 2012 to spread awareness about rail crossing safety. It’s comprised of a catchy song with humorous lyrics and simple jellybean-esque characters who die in increasingly dumb ways. Working alongside radio, newspaper and outdoor advertising, the video racked up 2.5 million views in 2 days and 30 million within two weeks of release. Short: It’s only a couple of minutes, you’ve got time to check this out. Lucky: You don’t know why you want to share this more than that other equally good video, but there’s just something about it. Unfortunately it’s next to impossible to plan for the last one. But we can take note of the others, look at how they apply to other viral brand videos, and consider how they might be instituted into the script for your next video campaign. While the message is undoubtedly the heart of any corporate animation, the visuals are the body, the outer shell that we first judge by. A video with an intriguing visual style, with an especially charming character design, or reflecting a particularly high level of skill is inclined to grab viewers’ eyes even with the sound turned off. ‘The Bear and the Hare‘, an animated campaign for British department store John Lewis, is a standout example of stellar visuals being used for emotional effect. The Christmas-themed commercial uses Disney-style animal characters in a woodland setting to remind us of sentimental animated specials of childhood Christmases. But most impressively, it uses a mixture of 2D animation and stop-motion with an incredible level of craftsmanship to create a style rarely seen in feature film, let alone corporate video. The behind-the-scenes footage gives a small glimpse into the skill and manpower poured into the campaign. So how successful was ‘The Bear and the Hare’ in gaining customers for John Lewis? Record-breakingly. Is that a word? No. Moving on. Their overall takings were up 10.7% on the previous year, and sales of the one product featured in the advert, alarm clocks, leapt 55% in one week. Record-breakingly. Success means something different to everyone, and similarly different brands will require different outcomes from their video campaigns. Some are startups needing to explain their product, some are businesses looking to convert visitors into customers, others are looking for social awareness. Whatever your brand needs, it’s likely there are similar stories of those who’ve gone before. Learning from both their successes and failures is a wise way to prepare yourself for what works and what doesn’t, especially in the fickle field of commercial animation.